A large distributor of pharmaceutical products in Switzerland wanted to enrich their existing product database to include product images, categories, manufacturer name etc. Each product in the database has an unique ID (pharma code), but no additional information. Moreover the client wanted to have an automated solution, to categorize the products by OTC, RX medicaments, Generic drugs, SL and non SL products and cosmetics at the moment they are added to the system. First we have introduced a new product master data system. We picked Akeneo for this www.akeneo.com, which is an open source Product Information Management (PIM) system designed for retailers looking for efficient answers for their multichannel needs. 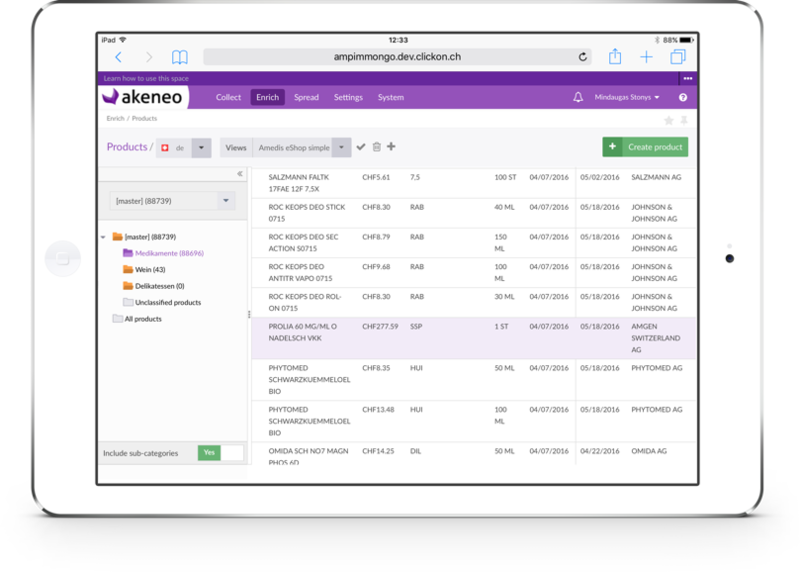 We prepared Akeneo to import data from internal ERP system and enrich it during the importation process. Product enrichment has been done by taking the date from logINDEX Webservices (http://www.hcisolutions.ch/de/customer-offers/wholesaler/logindex.php) doing a data lookup using PharmaCode. We have made a dedicated server setup at the customer’s internal servers to automated the process using Ubuntu 14.04 incron shells script. Data enrichment process happens every night.